For the New Zealand rugby player, see Kevin Skinner (rugby union). Skinner is from the Dublin community of Graves County, Kentucky, and started playing the guitar when he was 12 years old. He has been playing, writing, and singing ever since he learned the art of music from his musician father, Joe, who is a fan of Hank Williams. Skinner is divorced and has two children, a girl and a boy. 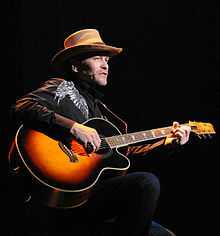 His debut CD, "Long Ride" was released on his namesake Saint Patrick's Day, March 17, 2010. The album was released online on September 14, 2010. "—" denotes the album did not chart. ^ "Kentucky Birth Index, 1911–1999". Familytreelegends.com. February 25, 1974. Retrieved June 9, 2010. ^ "Megan Fox, Louis C.K., Kevin Skinner Season Episode Guide on". Tv.com. December 1, 2009. Retrieved June 9, 2010. This page was last edited on 26 February 2019, at 07:13 (UTC).